FreeKB - Resolve "The security database on the server does not have a computer account for this workstation trust relationship" Resolve "The security database on the server does not have a computer account for this workstation trust relationship"
Select Workgroup, type the word WORKGROUP, and select OK. Select Domain, enter the domain name, and select OK.
You should now be able to sign into the PC using a domain account. If this message appears when attempting to map a network drive, ensure the computer that is producing the shared network drive is joined to the domain. Ensure the computer that is producing the shared network drive is listed in the Computer folder in Active Directory Users and Computers on the Domain Computer. In this example, the hostname of the computer that is producing the shared network drive is FS1. 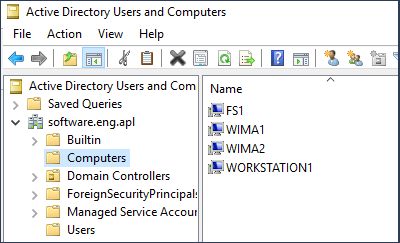 WORKSTATION1 is listed in Active Directory Users and Computers on the Domain Computer.